If you’re camera-shy or you think you have a face for radio or a voice for silent movies, using this app is an easy way to create professional quality videos that you don’t have to feature in. Get an ongoing 40% discount on Content Samurai fees plus my bonus package of 27 products. Content Samurai is an online video creator. It’s what I use to create my own videos, so I’ve no hesitation in recommending it. With this special offer you pay $29/mth instead of $47/mth. The offer ends at midnight tonight – Nov. 2nd. The 40% Discount on Content Samurai Is Back – but for 5 Days Only! The 40% Discount Off on Content Samurai Fees Is Back! But for 5 days only! In addition to my bonus package of 27 related products, with this offer you also get a LIFETIME subscription to the Vidsy copywriting software and the Ultimate Traffic Blueprint Pack. A library of thousands of motion backgrounds has now been added to Content Samurai making it even easier to create dynamic, eye-catching videos. If you sell on Amazon, this could make all the difference to give you an advantage in the coming year. Newly updated and fully ready for 2017, Import Direct From China and Many Other Countries is now on sale for only $17. It’s sold thousands at $97, but is available for a short time at 82% off for a few days only. Take your time, check it out and if at any point you decide this isn’t for you, you will get a refund. 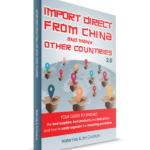 You simply won’t find a more authoritative and “keep it simple” guide to successfully importing profitable products! This is without question the definitive guide to importing – brought to you by two of the most trusted names in online business: Jim Cockrum and Walter Hay. SocialAdr is offering 50% bonus credits for the next 3 days in one of their flash sales. It works on a credit based system. You can earn credits as a free member which allow you to advertise your links. Or you can become a paying member and get a fixed number of credits per month. You can also buy additional credit packages to top up your account. It is in these credit packages that you get the extra 50% of credits. You do need to be a member of SocialAdr to buy these credits. the sale ends at midnight November 3rd. The team over at Proven Amazon Course have a new guide out for finding hot items on eBay to resell on Amazon, called appropriately enough “The eBay To Amazon Arbitrage Guide“. If you’re not familiar with the Proven Amazon Course, it teaches students how to build a business sourcing and selling physical products through Amazon. Why you MUST use eBay as a source of inventory How to search for and find the BEST stock on eBay What categories and products are the MOST lucrative How to source locally and save a BUNDLE on shipping How to find amazingly PROFITABLE products for resale that most people would never think of How to buy the BEST stock again and again from eBay sellers How to build relationships with ebay sellers and sell their products for them for a percentage of the profits! If you have a sourcing team, give them this book and tell them to do what it says. The guide is currently available at a 75% discount for $9.99. The sale ends on Tuesday, April 12, 2016 at 10 PM (EST). There’s only one day left to get the guide at the discount price. Click Here To Secure Your Copy of The Guide Before The Price Increases! If you’ve read a few posts here, you’ll know that we recommend Hostnine as a webhost. We use them ourselves for all our sites now. Why? Because customer support is fantastic, their webservers are well specified, their hosting plans are generally cheaper than Hostgator’s (depends on the hosting plan). We use their reseller packages which allows you to put one site on one cPanel. That offers protection from cross-site hacking which can happen on a Shared hosting account because several sites are on the same cPanel. And you can spread your sites over 55 IP addresses at no extra cost. Everyone knows that using multiple IP addresses is a good thing to do, right? To celebrate St. Patrick’s day (faith and begorrah! ), Hostnine are running a 57% Off sale. Take advantage of it! How would you react if someone told you that you could make 4 figures in passive income on 100% autopilot with your own physical product store that pays 50% commission with NO stock costs, no worry about shipping and handling or having a warehouse for stocking? Well, now you can with this! Alibaba makes $9.3 BILLION in sale in just 1 day and is bigger than Amazon AND Ebay combined. …Say goodbye to expensive monthly eCommerce platform fees. Xpresstores builds high converting, self-updating ecommerce stores in minutes and is available for 2 days only. It allows you to sell in LOW competition markets for bigger profits. Avoids eCom hassles like stocking and shipping You get paid up to 50% commissions with a 30 day cookie… …Plus the Aliexpress affiliate program is open to ANY US resident, so if you’re in an Amazon banned state this is for you :). Save $100 on Site Build It! It’s Christmastime, and you know what that means! The 2015 SiteSell Holiday Special is upon us, and I have some fantastic news for you. That’s right! From now until December 29th, you can get SBI! or SBI! for WP on sale for 33% off. This is how you can turn your idea into an income, and there’s no better time than right now, during the SiteSell Holiday Special. For less than the cost of a cup of coffee a day, you can create an opportunity for yourself, and one that lasts much longer than that Peppermint Mocha Latte. For example, Laura and Susan were working jobs that took them away from their kids too much. Instead of wishing things were different, they teamed up and created a business they could work on from home AND allow them to be available to their families at the same time. What was their “care about”? Having more time to be “mom” to their children. Need An Affordable, Secure, SEO Blog Built For You? Get Your Fast, SEO, Secure WordPress Blog Now! Jim Cockrum is back with a new Amazon Seller course that has a twist. Are you just getting started, and have NO IDEA where to start? You’ll get instant access, even if it’s 3am! Article Builder Review - Is it worth the investment?